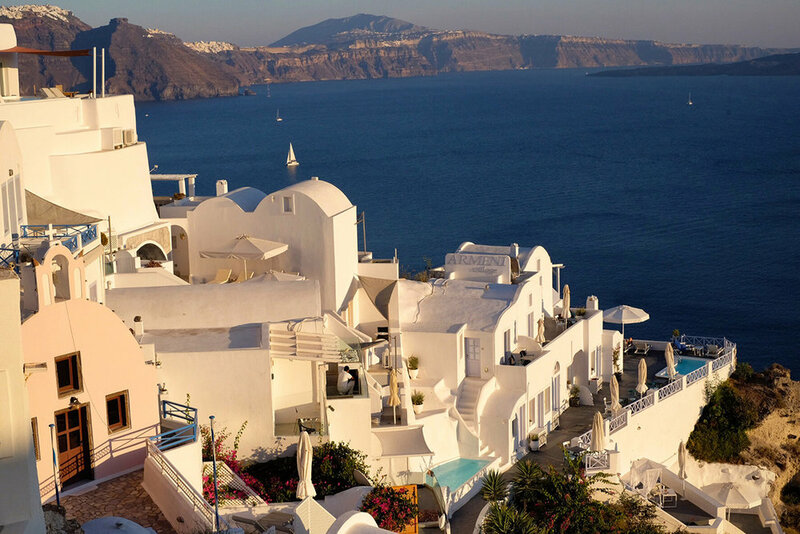 Santorini is a small island off the coast of Greece which experienced a devastating volcanic eruption 3,600 years ago. As a result, the soil is rich in lava minerals combined with the island's natural iron, sulphur, and pumice. Asyrtico grapes, as well as tomatoes grow perfectly in the soil, with the addition of heat and morning humidity from the Aegean Sea. The pumice in the soil soaks up the moisture and provides ample water for the plants. Santorini is immune to phylloxera, because of the volcanic soil, which results in the island having some of the oldest vines in the world. Grapes are grown in a unique system, known as koulara, where the vines are woven into baskets low to the ground, and the grapes face the inside of the "basket" ring. The leaves and vines protect the grapes from harsh winds and extreme heat. 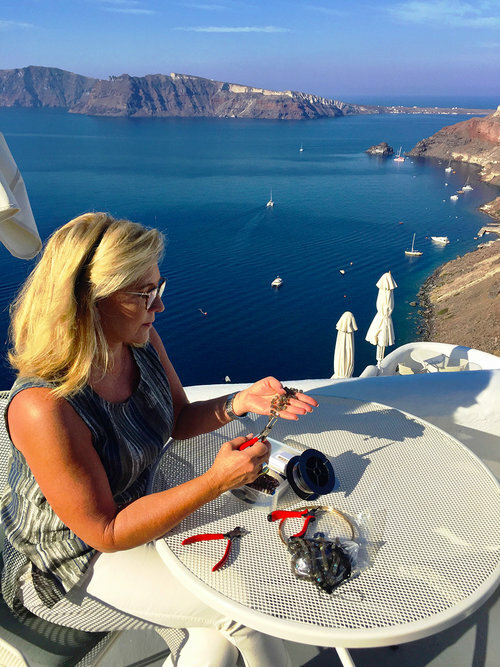 I took a fascinating wine tour with Santorini Wine Adventure Tours, which included tastings at three wineries and a cooking lesson at Aroma Avlis. In addition to growing outstanding wine grapes, Santorini is known for its delicious cherry tomatoes. They thrive in the high heat and rare rainfall on the island, and result in thick-skinned sweet fruit, which is delicious in the famous tomato paste and tomato fritters served on the island. Because there is no natural fresh water on Santorini, there are no farm animals used for food. The main diet is seafood and vegetables (and tomatoes, of course). Tomato fritters have been made in Santorini for centuries, and are often eaten as a main course or as a side dish. I made them in my cooking class, and had them at several restaurants, and they are absolutely delicious. 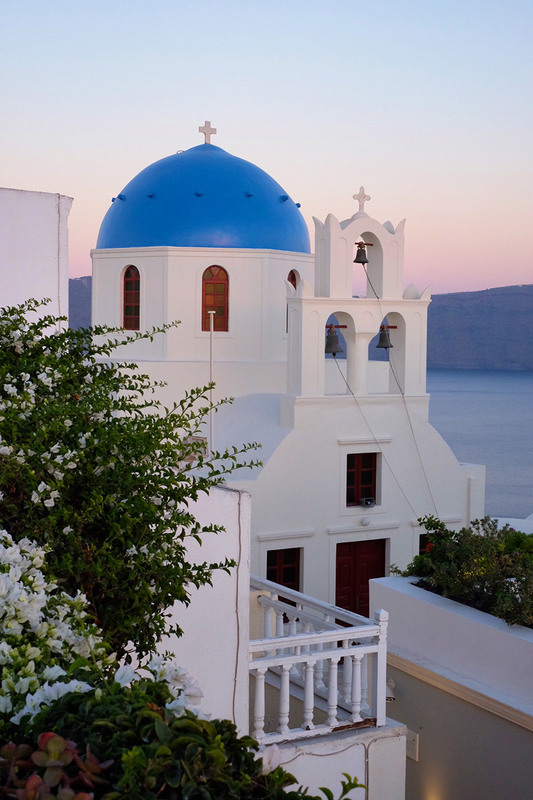 I must mention the amazing hotel in Oia, a famous town of white-painted buildings and blue-domed churches. The Ikies Traditional Houses is a beautiful collection of rooms and suites situated at the far end of the village, away from the hustle and bustle of the town. The rooms overlook the Aegean Sea, and the breakfast delivered to your terrace every morning is delightful. We have stayed at this hotel on two occasions, and I highly recommend it. Many tourists visit Santorini, so the best time to visit is mid-September to late October. The island basically "closes" in November for several months, and the summers are flooded with tourists. The sunsets are famous, and if you can get a restaurant view to enjoy the painted sky, you'll never forget it. The shopping is good, and the island is full of unique handmade crafts and jewelry. You can bet I filled my suitcase with some treasures! We've already started making plans to return to Santorini in five years with hopes of visiting Crete too. I've included a recipe for the famous tomato fritters, and I suggest serving them with tzatziki. 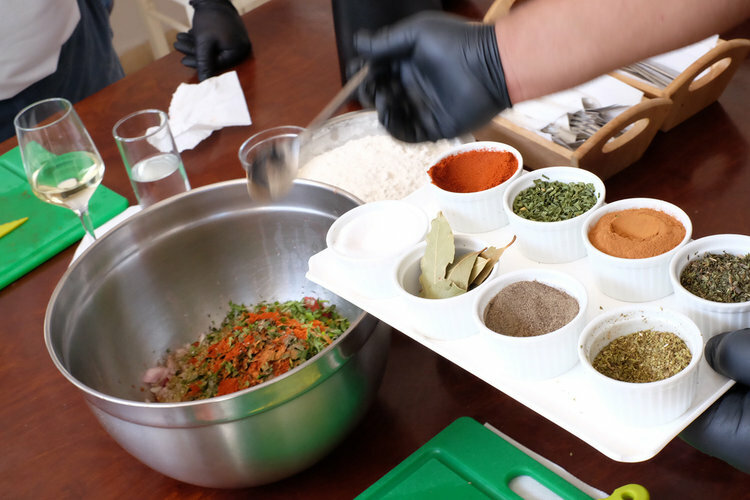 If You Give Them Spices, They Will Cook!